The kind of hype Google chrome created was unbelievable, and withing those two days it created an enormous fan base. Chrome has already captured around 1% of the Browser Usage. And that's frankly substantial for any browser, to say nonetheless. Google marketed its product very well and it paid off. So Many people even shifted to Chrome, but for those who didn't, but still wanted the look and feel of Chrome, there exists a Chrome Theme for the same for FireFox 3 users. 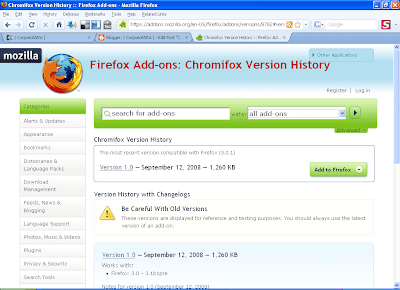 All you have to do is Download and Install Chromifox Addon to your FireFox. This addon/Theme would change the visual appearance of your Browser to like that of Google Chrome. The addon works pretty good, and makes FireFox 3 look almost similar to Chrome, but yeah, you won't find tab bar above Address bar as in case of Chrome, But still the addon does a pretty good job.